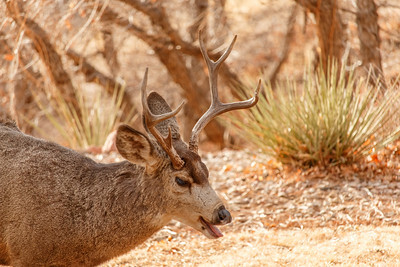 A tired deer after sparing. Poor fellow has a bad eye after a prior fight. A practice depth of field shot. 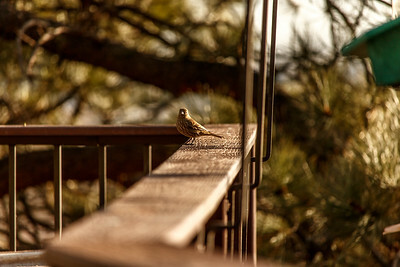 I had been still long enough the birds had gotten comfortable with me and my camera or almost, as this one seems to be thinking. Soon to be tired bucks lightly sparing in my neighbor's yard. A wonderful opportunity to practice my depth of field assignment! 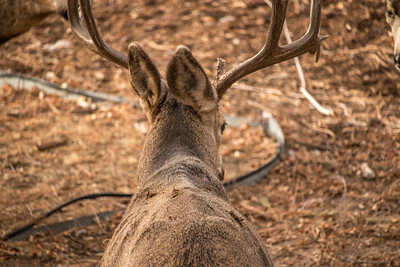 5 bucks were getting ready to nap in my neighbors yard so I quickly grabbed my camera to grab some shots for this weeks challenge. A sunrise photo to capture the ridgeline silhouette. A zigzag, wonky line! I like the mixture of trees and rooflines captured in this shot. You can just make out a single light from another early riser. No LR adjustments. 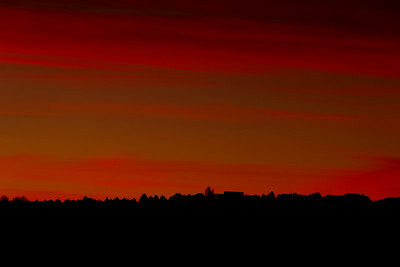 A sunrise photo to capture the ridgeline silhouette. A zigzag, wonky line! I like the mixture of trees and rooflines captured in this shot. You can just make out a single light from another early riser. 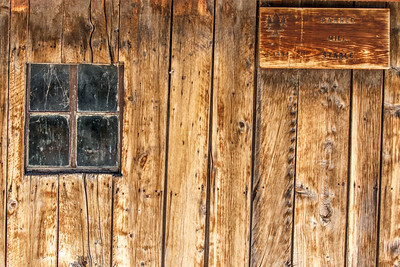 One LR adjustment - moved blacks to -100. Original windows (notice LOF etching) of a beautifully restored 1970 Cheverolt pickup truck. When I saw the challenge for this week's class my neighbor's truck came to mind immediately. 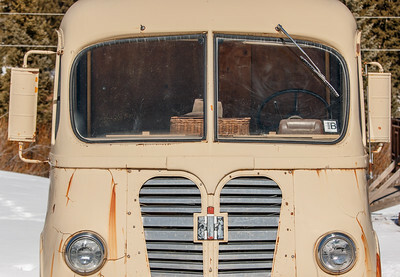 I love old trucks and liked the idea of an image that looked as if you were going to open the door to hop in for a ride. 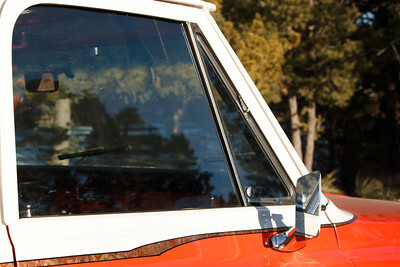 Untouched challenge photo of Restored 19070 Cheverolt pickup truck side windows. 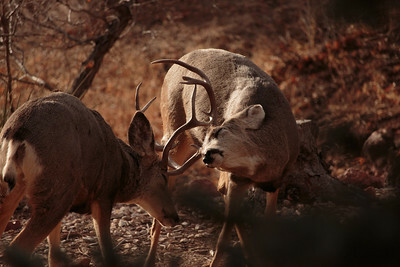 Photo taken in Red Rocks Canyon Open Space Quarry area. Gusts of wind made for a challenging time shooting, but actually helped with my patience in setting up the shot while waiting for a calm moment. 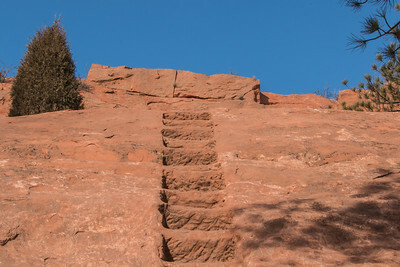 At the top of these steps is a flat area about 25 yards from steps to the rocks beyond the tree on the left. 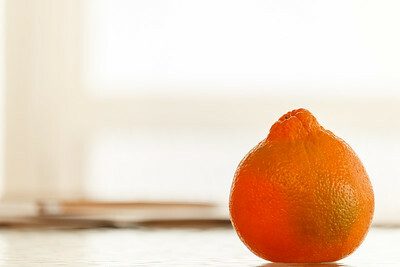 The Honeybell orange was so yummy! I got a box of them for a birthday present from my Mom and decided to use one for the challenge this week. This picture is my attempt to capture One Shape and tell a story at the same time. I learned a lesson in shooting with the bright light behind me, to use my light meter setting from aiming at the floor near my feet before composing the shot. I can imagine an advertising logo in the upper left extolling the features of Florida sweet Honeybells. Sifted through many ideas for this challenge! This photo was taken on a very cloudy, overcast day. The set up uses a red glass charger plate as the base. 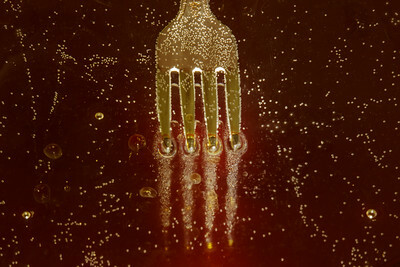 There is a clear Pyrex baking dish with water and oil and of course the fork, center of all our attention this week. I used a little flashlight on its low setting pointed toward the charger from the direction of the camera. 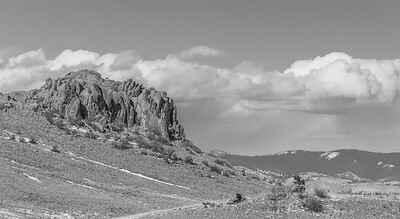 Very little LR adjustment, mainly the white and black and a smidge of + clarify. Used PS liquify tool to distort a flaw in the baking dish so it is not apparent. 55-250mm lens at 152mm ISO 100, f/22 for 8 sec. A back country roads drive on a cold, blustery day provided this photo opportunity. Checking in, anyone? LR adjustments limitied to B&W, highlights/shadows, whites & blacks. No PS, no cropping. ISO 200, f/13 fo 1/80 sec. 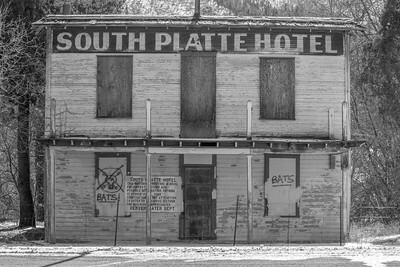 This photo was taken in Park County, Colorado near the center of the state. It was a cold and blustery day. This location always makes me think of Wyoming with its open ranges. I have hiked to the top of that rocky crag to take in the extended view. The tripod and remote shutter were very useful for this shot. Used crop tool to remove power line on far right. The "Couples Rock". A sunny, but cold, blustery day in Colorado. 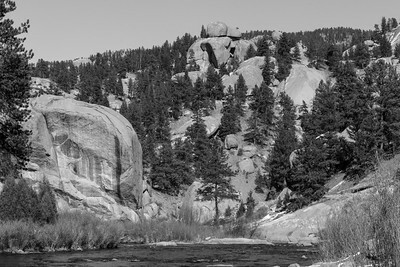 A scenic drive with my husband and a picnic lunch along the South Platte River. ISO 200, F/18, 55mm, 1/160 sec. No crop, basic LR shadow/highlight/black/white edits. Gave aqua color a nudge to negative. 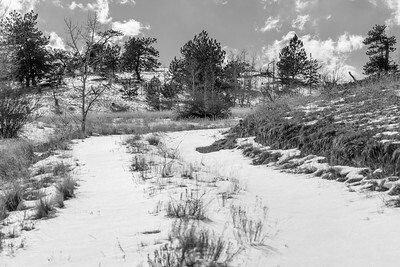 A country road in central Colorado. Jack Rabbit tracks shows the only usage of this snowy route. Where does it lead? A few adjustments in the color ranges made sharper contrasts in a few areas. The tripod was very handy. Wished I had some hand warmers in my pockets! 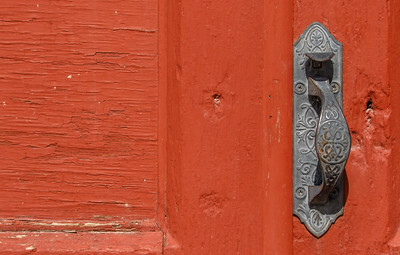 A lovely old door handle found on a building in the ghost town of St. Elmo, Colorado. There was a somewhat modern locked latch just above that I had to avoid. A bright, sunny day. Minimul LR, small crop off top of photo. ISO 100, f/5.6, 1/320 sec. 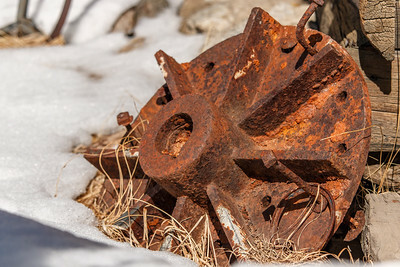 A rusty piece of old mining equipment perhaps? 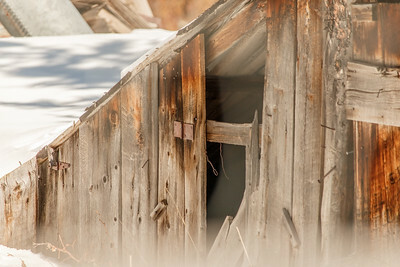 Found in the ghost town of St. Elmo, Colorado. A very bright, sunny day. ISO 100, f5.6, 1/400 sec. 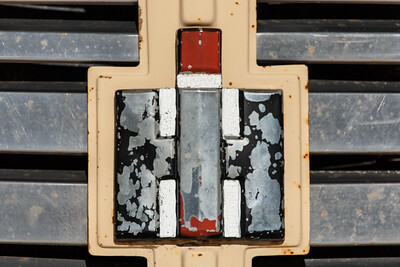 Emblem on an old International Harvester Metro truck found in St. Elmo, Colorado. Bright, sunny day. ISO 100, f/5.6, 1/800 sec. 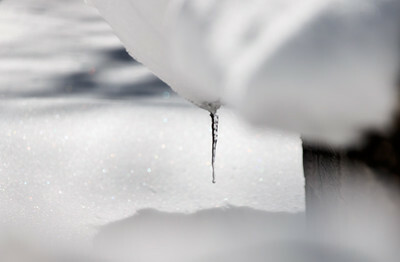 Icicle found in St. Elmo, Colorado on a sunny day. Had to crouch on a snowbank and peer between the wooden fence to take this shot. 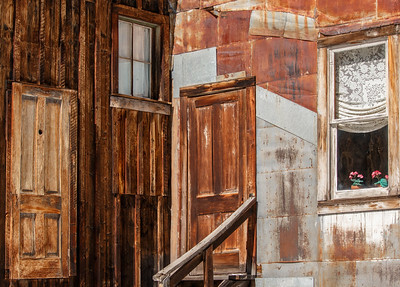 An old building in the ghost town of St. Elmo, Colorado. A bright, sunny day. My sister was with me on this outing so I asked her to be my assistant. It was nice to have someone I could hand my glasses to when I peered into my viewfinder! For this shor I had my tripod fully extended while I stood on a step of a boardwalk ourside a metal fence. 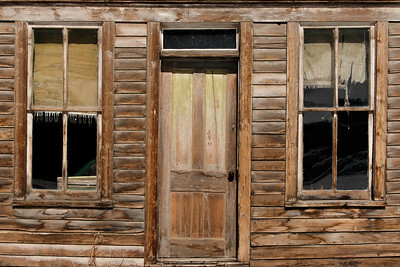 I cropped the edge of a white door off the left and used the transform tool on the upper right corner. I think if I had been able to lift myself up another foot or so I would not have needed to make those adjustments. As it was I almost tumbled down the step once I completed the shot. So many things to think about while taking a photograph, like watch your step! Part of an old building in the ghost town of St. Elmo, Colorado on a bright, sunny day. Used a tripod with camer adjusted high enough to get the lens over a fence. I like the angles in this shot.